Introducing the MX-65xx Matrix Switcher series by tvONE. The series includes MX-6544 (4K60 4×4 HDMI 2.0 Matrix), MX-6584 (4K60 8×4 HDMI 2.0 Matrix), and MX-6588 (4K60 8×8 HDMI 2.0 Matrix). The MX-65xx Matrix Switcher series was first revealed at InfoComm 2018 and BZBtv was there to catch it all! Check out our video below to see the highlights. The MX-65xx Matrix Switcher series allows the distribution of HDMI 2.0—with HDCP—sources to multiple displays independently or simultaneously. This is all done through a variety of ways: utilizing the intuitive front panel, IR remote control, tvONE’s control software, MX-tools, or by using the simple API with a third-party controller. The MX-65xx Matrix Switcher series is HDCP 2.2 compliant, providing full support for 4K/2K@60 4:4:4 8-bit and 10-bit processing for deep color rendition. Also supported are 3D signals. Audio capabilities includes 7.1 audio, DTS-HD, and Dolby TrueHD. The MX-65xx Matrix Switcher series is the ideal solution for all your installs including home theaters, conference rooms, or classrooms demanding high-level performance and superior 4:4:4 4K/60 image fidelity. For more information, contact BZB Express at 1.888.660.2962 or email support@bzbexpress.com. We provide full service for all your audiovisual needs. Browse our entire online catalog for countless possibilities regarding your project. Catch the buzz on our YouTube channel BZBtv for insightful demos and reviews on the latest AV gear. Please show your support and subscribe! This ensures you won’t miss out on future episodes. tvONE is a world-class manufacturer and developer of AV signal distribution and video conversion technology. They provide a complete line of services and products for the professional AV, digital signage, and broadcast video markets. 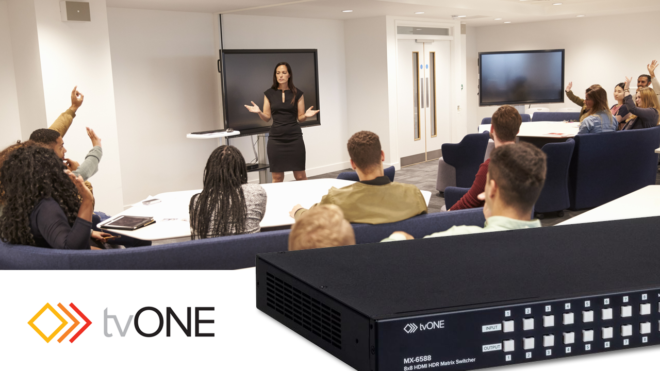 tvONE specializes in audio, video, and multimedia processing equipment based on their proprietary video conversion technology CORIO®.